Homepage IN THE NEWS Shootings of wild horses and Wild Horse Management Group. Modern day wild west horror story in a National Forest in Arizona. 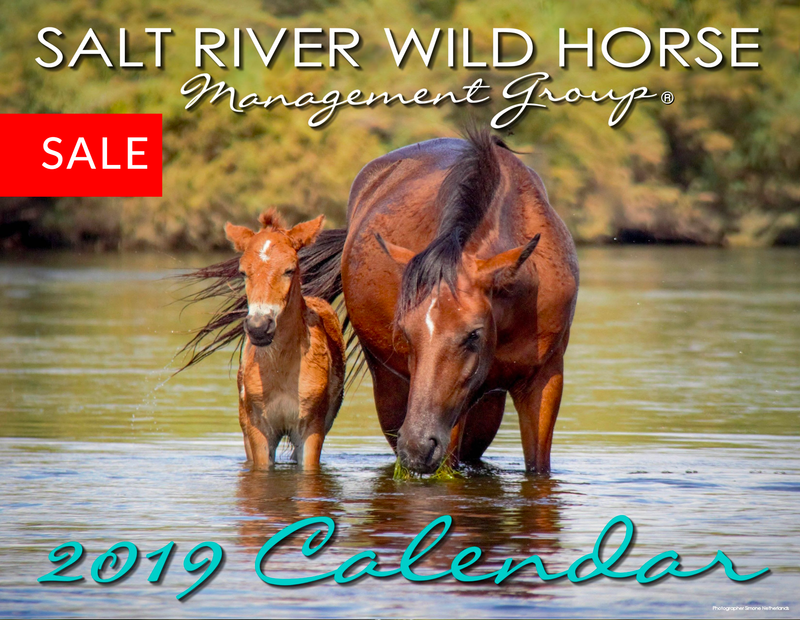 The Salt River Wild Horse Management Group is in Heber, Arizona with a team of 6 volunteers and our Heber affiliates. We are finding out a lot more about the recent apparent shootings of Federally protected wild horses and we are checking on the horses that are still alive. We are on National Forest Service lands just outside of the Apache Sitgreaves wild horse territory. Many decaying carcasses lie in a relatively small area of approximately 3 square miles, located right behind a popular tourist destination of Bison ranch which is built just like a historic wild west village. 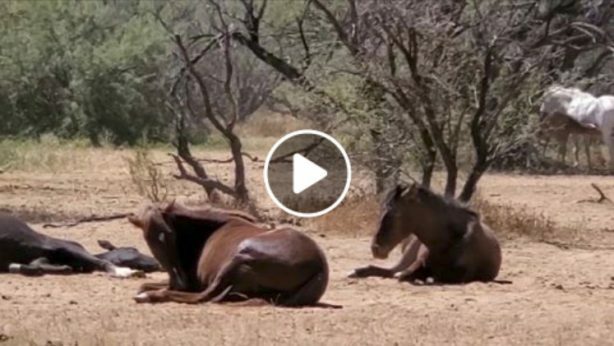 “This is the wild west, but bloodbaths of these proportions belong in the historic past”, says Simone Netherlands, president of the Salt River Wild Horse Management Group. Robert Hutchison, Wayne Ramey and a young trailguide named Rowdy, called the SRWHMG for help. They are very much grieving these horses whom they have been watching here for years. They are running the popular Ramey horse rides at Bison Stables and they live next to it. The first carcass of a wild horse lies less than a quarter mile from the stables. ” I heard the gunshots and wish I would have gone out to see who was outthere, I feel bad about that now”, said Wayne Ramey. Robert Hutchison shows us pictures of a mare and a fetus next to her that looks close to term. “She must have lived just long enough to abort the foal before she died, said Wayne who was horrified when he found them. They have many pictures of the horrific suffering that has happened here starting around January 10th, including pictures of some bullet wounds. There seems to more than ample evidence here that these horses are not dying from some mysterious disease, but are being gunned down in cold blood. Locals are wondering why, and some of them have strong feelings as to who they think might have motive. Not far from the decaying carcasses of a stallion and a mare, stands the cremello yearling filly, still alive, but stoic. She appears to not know what to do next; they were her mom and Dad. 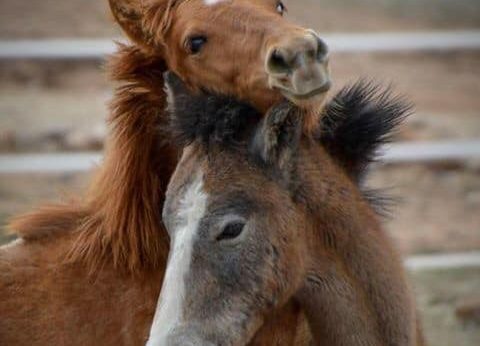 These wild horses are a real boon for the local economy through wild horse tourism; when you hurt a wild horse you hurt the American public who loves them, states Suzanne Roy, director of the American Wild Horse Campaign. We will do everything in our power to bring justice for the heber wild horses. For tips please take the proper routes and contact the Forest Service and NCSO. There is no need to donate towards reward monies right now, as they do not have to be paid out until a perpetrator is found and arrested and convicted.